The home secretary has denied any rift over funding between Downing Street and Labour Party officials following revelations about secret loans. Charles Clarke said it was reasonable for an internal inquiry to take place, but denied "cash for peerages" claims. 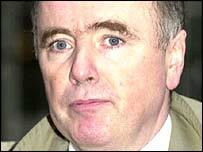 Labour's treasurer Jack Dromey has said he did not know the party had secretly borrowed millions of pounds last year. An inquiry by Mr Dromey and the party's general secretary Peter Watt will report back next week. Mr Dromey's comments follow a furore over three men who were recommended for peerages after lending Labour money. Unlike donations, loans do not have to be declared. Mr Dromey said Downing Street must have known before him about the loans - which amounted to "millions" of pounds. But Mr Clarke, speaking on BBC Radio 4's Today programme, said suggestions that a rift had developed on the issue of funding between the party and Downing Street were "rubbish". And he denied any suggestion of there being a "cash for peerages" arrangement. "The suggestion that there's cash for peerages which is a suggestion which is in widespread currency is completely false. It's not the case," he said. He told the programme he fully supported the internal inquiry into the matter, saying: "The treasurer should know about all the fundraising issues that arise." Asked about claims that Tony Blair's close ally, Lord Levy, had acted as a go-between to secure the loans, Mr Clarke defended the peer, saying: "It would be quite improper if there was a cash for peerages situation. That's not the case, and that's not the way Lord Levy or indeed the Labour Party generally operates." Mr Clarke said he could "see a case" for looking into the issue of loans and whether there should be a change in the law to ensure they are declared. "It is important it is investigated and we find out precisely where the money came from, what it was for and on what terms," Mr Hopkins told Today.